The event was graced by the celebrity couple Gelli de Belen and Ariel Rivera. While Chuckie Dreyfus and wife Yen, together with Kopi Roti Philippines Vice President for Operations Jenz Tecson, they all led the ribbon cutting to signal the reopening of the store's new revitalizing look. 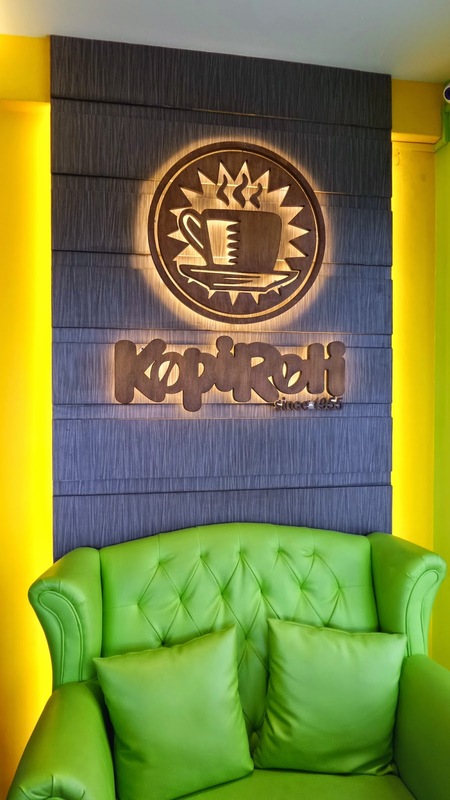 According to Jenz, the original look of Kopi Roti stores was inspired by the traditional Singaporean coffee stalls called Kopi Tiams, Now, what was designed as simple and practical, were given warmer, friendlier, and has more premium look and feel, yet had retained the no nonsense comfort to it. In line with the innovations, both to the stores and menu, a promotion campaign was also set in motion through social media. The slogan, #KeepRising is the company's "catchphrase and battlecry," said to bring inspiration and motivation to its customers. especially the young ones. "As the Southeast Asian brand that is still growing in the Philippines, we are inspired by the fact that the country and the region are on an upswing like never before. Since its early days in Singapore, Kopi Roti has always been a brand for people who are not just on the go, but on the rise. We are keeping that tradition alive for today;s generation," Tecson explained. #KeepRising is a positive, inspirational and motivational campaign where messages and contents that are relevant to the customers are shared. They aim to uplift and energize our days, just as their products do. 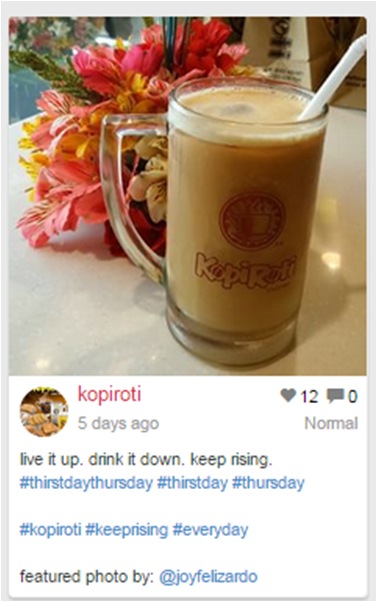 So may you not forget to add the hashtag whenever you get to post your photos on IG, FB or Twitter when visiting any Kopi Roti stores and share in their goals. We were also introduced to their latest product offerings. The idea was to keep the cafe feel with the Singaporean touch at the ground floor level of the Katipunan branch, while a new Malaysian concept resto is being planned in place at the second floor. From the thought of their meal offerings which I frequently order at their Newport Mall branch, I was adamant of the idea of just having their famous beverages with paired with just coffee buns, kaya toasts and soft-boiled eggs. It was not a surprise to me that they would reinvent their celebrated coffee buns into some sort of sandwiches. Removing the rice meals and noodles from the menu may mean removing savories, so it was nice stuffing the buns with conventional faves such as bacon, Angus beef patty and some veggies to complete it. Bacon lovers unite! Have your coffee bun stuffed with pan-fried bacon, fresh lettuce and tomato. Above is the Kopi Bun with BLT (P 170). (P 250) is a Certified Angus Beef patty topped with fresh cabbage and red onions on a a homemade Kopi Bun. My favorite among the three is Kopi Bun with Chicken Satay (P 180). In between perfectly baked Kopi Bun is a marinated and grilled Chicken Satay, topped with shredded cabbage and marinated red onions. Their Kaya toasts have been reinvented as well, with the addition of cheese and egg. Now you can have Kaya Cheese Toast, that's four slices of toasts with cheese and of course the special Kaya spread. My kids can nosh on Roti Kaya Cheese Toast and Egg anytime of the day. Tucked in between two kaya toasts are cheese, kaya spread and egg.